Engineered to change the industry, the Covert Code Black trail camera utilizes a GSM-network activated SIM card to send photos via text to your email address or cell phone. 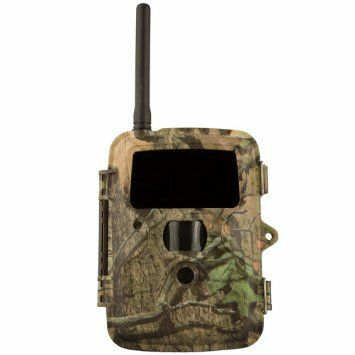 Using advanced technology, this trail cam lets you see what goes on in your property without the need to physically go to the unit and check out the SD card. Perfect for wildlife and security applications, this device is pretty useful thanks to a host of highly functional features. This trail cam is made extremely lightweight, which enables effortless movement from location to location. Able to share plenty of photos, the unit can be installed with a separately purchased 32GB SD card that stores all those images for later viewing, eliminating the need to visit the camera frequently and thus keeping the site scent-free. Perfectly reliable, the camera sends images every 60 seconds so you are constantly updated on what goes on in your property. The 12 MP unit works with a GSM SIM card and major providers include AT&T. It won’t matter what carrier you have for your phone, as the essential thing is to match that to what delivers the best reception in the site you intend to set up the camera. Set up is definitely easier compared to older camera models thanks to the advances in cellular technology. This no-glow camera is ideal for surveillance and wildlife purposes. Enabling you to perform internal programming straight through the camera’s setup screen, this camera allows you to do that if you only intend to send to a telephone number. The setup is relatively simple. The trigger time is a little more than a second and recovery time is pegged at 77 seconds, depending on the cell network the unit is currently running under. The detection range is impressive at 80 feet so there’s very little that this model will miss. The two-inch color viewer lets you check whether the unit has been set up optimally. The time lapse mode lets you take a full day’s worth of activity and just view everything in a matter of minutes. The three adjustable sensitivity levels allow you to select the one that works best for your purpose. The camera provides time and date stamps as well as temperature and moon phase stamps for updated and factual monitoring. Operating on a set of 12 double-A batteries, this trail cam has 60 undetectable flash LEDs to ensure adequate lighting. The flash range of 60 feet ensures that there’s sufficient illumination when the unit captures images, all while not spooking the animals away. The Mossy Oak infinity breakup camo design keeps the camera hidden from the game as well as from other hunters, preventing vandalism. This unit delivers wireless transfer of 640 by 480 size photos to your phone via email or text. The unit has good overall battery life so you won’t have to do frequent replacements. It works based on SMS commands to eliminate the guesswork. The threaded tripod insert enables setup with a camera tripod for convenience. Get brighter color images with good depth and differentiation during the day even without a canopy cover. The two-phase timer switch lets you choose between the custom start/ stop time mode or the 5-second to 8-hour time intervals. This unit also enables you to take from one to three multiple shots each time and to make video clips lasting from just 5 seconds to a full 60 seconds for intensive observation and monitoring of your target. You can set the flash settings between high and low, along with the password protection capability. This is durable enough to withstand the elements. The camera can last up to 2.4 months out in the field on a set of lithium batteries and with normal use. That’s a total of 3000 photos in all that you can review and study. By connecting easily to the approved wireless network, this camera lets you see photos as soon as it snaps them. The revolutionary 3G technology ensures that the camera always gets better signal, thus resulting in the delivery of improved quality images while maximizing the battery life. Once you have the activated SIM card in place along with a 32GB SD card, you can turn the camera on to the setup menu and the camera will do the network search by itself, which usually takes a minute or so. You can view essential data including the number of megapixels (12) for the unit, the signal strength and the network signal strength. Once you see the network name on the top portion of the LCD screen, it means the camera is connected. You will see a battery meter on the bottom left corner of the screen, minimizing the guesswork and for prompt recharging as needed.